Two Letters in Spanish that a couple wrote for Valentine’s Day. One of the letters is romantic, while the other is crazy (not at all romantic). Due to some of the vocabulary, these letters would ideally be for Spanish 2 level students. There is also another letter with some of the spaces blanked out (some adjectives and nouns) so that students can fill the gaps to make their own Valentine’s letter, either for a friend or someone they like (imaginary or not). The letters are 100% in Spanish making it ideal for all nationalities learning the language. Note that the teacher’s guide is completely in Spanish. 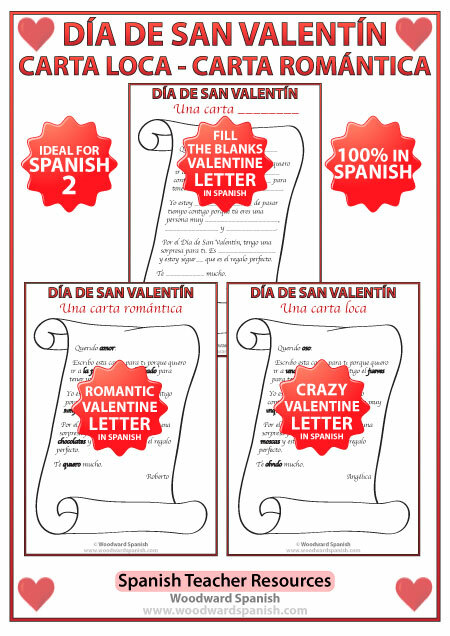 Hay dos cartas del Día de San Valentín (Día de los Enamorados). Una es una carta romántica, y la otra es una carta loca. También hay una carta con espacios donde los alumnos pueden crear su propia carta de San Valentín.